HomeFriends of MotherlodeGiveaway: Professional organizing from The Organizer Chicks! 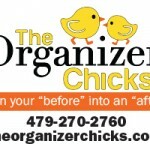 Giveaway: Professional organizing from The Organizer Chicks! Mamas, we are SO excited about this week’s giveaway because we know it’s something that almost all of us have wished for at one time or another. If you’ve ever fantasized about how great it would be to have a Professional Organizer come over and help you finally get your house in order — organized in a way that truly works for you and your family — this is the giveaway that could make it come true. As owner Amber Taggard pointed out in our recent interview, some people feel guilty for needing a Professional Organizer’s help. But the reality is that we moms hire professionals all the time. Would you feel guilty for hiring an electrician to come over and fix a broken fuse box? Nope. The electrician knows things we don’t know and has specialized training in his area of expertise. Professional Organizers are also specifically trained to put rooms and/or entire homes in order as well as develop new systems and routines that will help you KEEP that organization intact. Electricians don’t judge you for a broken fuse, and Professional Organizers don’t judge you for a cluttered space. They are simply happy for the opportunity to transform a space and make a positive difference for their client. HOW TO ENTER: To throw your name in the online hat to win this giveaway valued at $480, click the word “comments” (located right under the headline of this post). Then scroll down to the bottom of the posted comments. Once the organization work is complete, we’ll share that person’s experience and before and after photos here on nwaMotherlode.com, so fellow moms can read about and see what professional organizing in action really looks like. You can also earn extra chances to win by being one of our newsletter readers. Newsletter subscribers get free access to the good stuff, including exclusive giveaways (like this one), information about local events, local mom interviews, recipes and more. The nwaMotherlode newsletter is delivered straight to your inbox so you don’t miss anything awesome. CLICK HERE to sign up. We won’t fill your inbox with info, no worries. We only send out newsletters when there’s something in it for you — and we know you’ll be interested in hearing about it. BE SOCIAL: You can also earn extra chances to win by commenting on our Facebook page, following us on Twitter or following us on Instagram. If you do any of those, just mention it in your comment or email so we can give you proper credit. 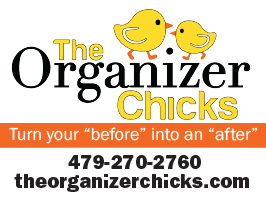 For more info about The Organizer Chicks, click HERE to visit the website or click HERE to read our recent interview with the owner, Amber Taggard. Divine in ’09: Home Makeover Winners! I would LOVE to have my closet and laundry room organized… Every time I try, I give up halfway through… It’s so discouraging. My master bath and closet. Garage for sure! We moved into our house 6 months ago and the garage is still the space that is unorganized. Was supposed to be my husband’s job, but he thinks it’s fine the way it is. We have 3 car garage and he still parks outside, so I think that shows we need help! The kids education/art space in the living room needs help! Laundry Room and Office… I need so much help. I start out and get discouraged… Maybe if someone else does it, it will happen and stay! My closet! I’ve gone through so many sizes in lately from being pregnant and losing the baby weight and my closet has become a catch all! The kids’ playroom! I have labeled bins in a cute shelf, but it’s not working. I would love some help! Our Garage space needs organizing desperately! It’s our “catch all place” ! Help! It is a toss up between our garage and our bedroom. Both seem to be “dumping” grounds for things we don’t have a home for. With baby #4 due this spring, we need to find solutions soon! I get your newsletter, follow on Instagram and Twitter, and commented on FB. I actually have two areas I would love to have organized! Our office closet that serves as our art/craft and homeschool supply closet along with our kitchen pantry. This organization session would be a blessing! Master bedroom/closet…if it were more organized our day would start out and end better! My master bedroom is always the last on the list for organizing. In 28 years of marriage, we have never been able to have that relaxing, beautiful suite to enjoy. I have tried several times to try to organize, but just get discouraged! It would be a wonderful gift! I think I would have someone help organize my bed room. It always seems to be the final frontier when cleaning and the place things that don’t have a home randomly collect. Which room wouldn’t I want a professional organizer’s help!? But, the master closet probably needs it the most. It’s a great size, so I tend to throw all my “don’t know what to do with this” stuff in there. Definitely our rec (wreck) room! It causes me WAY too much grief. Our garage & a few closets need help! How long do you think the whole house would take?! The garage DEFINITELY needs help- so we could park both cars in there. But also the craft/guest/beading room too. So we can walk in it. (haha?) I’d love to win, imagine how freeing it would be to have everything organized and functionable!! My daughters room/play area are in need of a major overhaul! I would love the help. I’d love help with my garage! It’s be nice to be able to put a car in there. My bedroom and closets for sure! I may have a slight tendency to hang on to EVERYTHING. Would love to win this and get truly organized! I would say my daughter’s room and closet. She will be leaving for college in the fall, and we will need to figure out what goes with her, what stays in her room, and what can be given away or sold. She is a thrifter and has a big wardrobe!! So hard to choose which room I would have organized but I would go with either my closet or garage!! My daughter’s closet and the playroom! My problem areas for sure! My kitchen cabinets and pantry need some organization love! I could really use the help in my garage. My daughters room. Maybe she will listen to someone else! I would like my garage done that would be great! Oh gosh!! This would be so helpful! I am embarrassed to have people over to our house because of the mess that is our lives. I would use this for the garage or the office as those are the two worst in the house. I follow you guys on Twitter, Instagram, and have commented on your facebook! I thought I posted this, but it’s not showing up. Sorry if I posted twice. Rather be safe than sorry!! 🙂 I could definitely use this for our garage or office. We have started purging, but these two rooms have not yet been touched as they are very scary to me! 🙂 I have commented on facebook, and I follow you on twitter and instagram. Anything to increase my chances!! What a awesome giveaway! This would be SO amazing with a 4 and 5 year old! I desperately need help organizing my kitchen/dining room area. I’m a mom that prides herself on a clean well cleared surface and honestly it is hard to figure out where to put everything in my house that comes through the front door. So unfortunately it ends up on my counter space and dining room table. I HATE it, I clean it and 2 hours later, cluttered again. I need help reorganizing my kitchen area so I have separate spaces for all the excess things. I mean come on, what’s family without a family dinner on your own dining room table together! 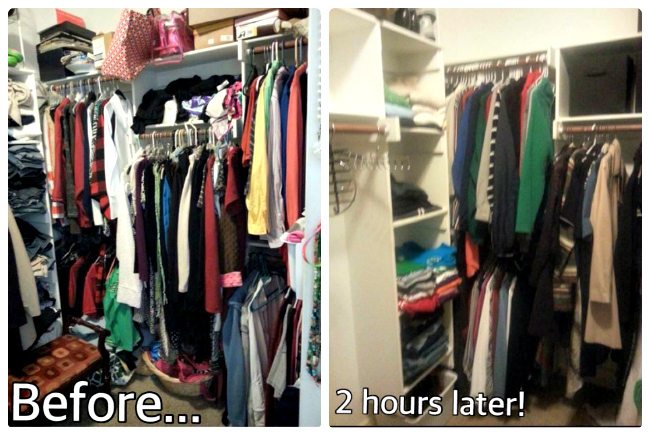 My closet – I’ve been working on it but it’s a hot mess! My garage needs it so badly! I would love to have our laundry room/pantry organized. It is a catch all for everything because we don’t have any storage closets in our house. And it’s always a gigantic mess! My new year’s resolution is to get rid of clutter in my house so this would be a perfect way to get a start on it! Garage, bedroom, office……anything would be helpful! Such a great giveaway! I follow newsletter, fb, and Instagram. This would be so wonderful! My master bedroom and closet need major help! My garage! It’s the only place that needs work but every time I try I get overwhelmed thinking I need some big, expensive organization/storage system. My children’s bedrooms. Wow, what a nightmare! Our “office.” We never unpacked the boxes in it after we moved into our house four years ago, and since then we’ve just added more junk. I’d love for it to become a playroom or extra bedroom, but honestly, just being able to open the door fully would be an improvement. Our guest room. We don’t have a garage, so some garage stuff ends up in there. And anything else I need to hide/get out of the way. And now that’s spilling into the office! So one or both of those need organized before we move our daughter into her own room in June. I get your newsletter & follow on Twitter. My master closet for sure! We have a shop house with lots of space but limited storage. Getting organized would be amazing right now! First I thought it would be my laundry room but it might be my bedroom. Or bathroom! The possibilities are endless! 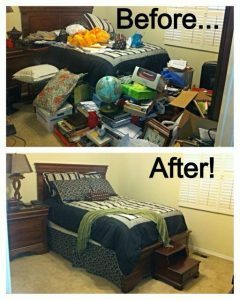 It would be such a blessing to have help organizing my kids shared bedroom! I feel like if we had a method in place it would be easier to keep up! My utility closet because it’s the only place we have for storage and as much as I’ve tried to organize it I don’t think I’ve done it the right way. I’m sure professional could get me better use out of the space. My daughter’s room! We just had baby #3 and she will be sharing with her big sister soon and there is SO much girl stuff. Help organizing Polly pockets to princesses and American Girl dolls and all the kid clothes would be fantastic! Probably either my laundry room or garage. They’re a mess and I can’t ever seem to catch up enough to get them organized, well! Oh man! Does the whole house count?! Probably my bedroom or kitchen if I had to choose. Mostly I just need to get rid of a ton of stuff! Oh my gosh! 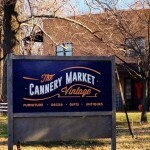 I would love to win this — Kitchen and pantry help! Oh my..,if I only get to pick one room… Right now it’s a toss up between my daughters playroom and the garage! I would probably go with the playroom though just because I have no earthly idea how to coordinate everything and make it look good and still be a playroom! I pick up…she thrashes the place…repeat…it’s never in a great place! Definitely my craft area. I started my own business in August, and trying to stay organized and productive in such a small space has been a nightmare! I’d love for everything to actually have a place so that I know what I have BEFORE starting a project. I would LOVE to have my kitchen and/or laundry room organized!!! How awesome that would be!! Our closet, spare room, and garage–yes, we may have to pay them extra. I have fibromyalgia and cannot get to these things myself. So hard and frustrating. I could def use the help and want these spaces to be organized for my family. Thank you for doing this. My play area/craft room. My sewing/yarn area shares a space with my kiddos logos and media area. It needs help!! Would love to have our walk in pantry organized or our master closet! Lots of hidden treasure in there that needs major help! My closet!!! Then I want to hire you for my whole house!!! my house flooded in October and I am just now living in it. stuff is boxed up and piled up everywhere! I’d just have them help me in the most productive way! I’d love have help organizing my kitchen. There’s not a lot of stuff, but I feel like it could make so much more sense in a different order. It would be a toss up between 3 spaces in my house: daughters room, kitchen or master bedroom….i don’t know which yet, but I will when I win! I feel like I could learn so much from having these ladies for a few hours! Oh how I would love my bedroom to become a relaxing place of peace – not laundry and clutter! !